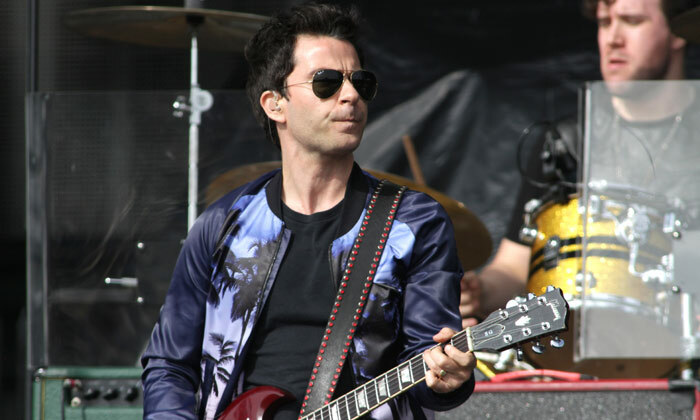 The Stereophonics machine has been gradually building up over recent months with festival performances and the announcement of ‘Scream Above The Sounds’, their tenth album due for release in November. Tonight’s event is at a venue smaller than the arena habitat in which the band are usually found in the UK, a rare opportunity to get close and personal. There’s a reliability to Stereophonics which is comforting for their followers and ammunition for their detractors and it applies to their music and shows. So when Kelly Jones takes to the stage by announcing first album ‘Word Gets Around’ is 20 years old and they open with ‘Looks Like Chaplin’, it’s greeted with glee and near disbelief. Any suspicion of an anniversary show will be dispelled as the night progresses, with staple set numbers ‘A Thousand Trees’ and ‘Local Boy In The Photograph’ the other tracks celebrating their twentieth, but that’s not to say there aren’t a few surprises. New tracks ‘Caught By The Wind’ and ‘All In One Night’ get road-tested, the former being the type of radio hit the band have spent two decades regularly turning out and the latter featuring a dynamic outro that should have made the studio version. Also performed are the rarely-heard ‘Step On My Old Size Nines’ and ‘Vegas Two Times’ and whilst admittedly neither may be the first choice of many a fan to pull from the archives, it’s certainly refreshing to have the unpredictability in the show. There is of course an obligation to smash out the hits and over the course of nine albums there’s plenty to choose from – ‘Have A Nice Day’, ‘Maybe Tomorrow’, ‘Just Looking’ and ‘Graffiti On The Train’ to name but a few. ‘Mr And Mrs Smith’ from their last album proved Jones can still pen a classic ‘phonics number and on stage it gets the added bonus of a superb solo from drummer Jamie Morrison. It’s almost taken for granted that the performance is clinical – there’s no bum notes or missed beats here – but it’s also appreciated that an arena production has been crammed into a theatre hall. Sure, they’re unlikely to start flying drones around the room or have cascading waterfalls, but it would have been easy to scale things down in this setting. That isn’t the Stereophonics way though – it tells they take pride in their work and their work tonight is to entertain on stage. They do it for a firm two hours, concluding as ever with ‘Dakota’, a reliable way to send the masses home happy.